* Personal Pretzel-Bottomed Ice Cream Pie! Told with Lisa’s signature wit and sassy style, these recipes are as fun to read as they are to make! 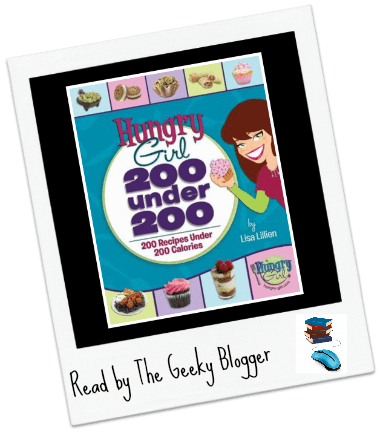 Hungry Girl 200 under 200 Calories by Lisa Lillien: There were a ton of good tips in this book. I also enjoyed the creative uses of many different ingredients. This book had a little too many tofu recipes for me (I just can’t handle the texture) so too many of them I could not try. I would suggest this book to anyone who likes to try new things. Do not forget for those of us on WW, the points totals are listed on her website.